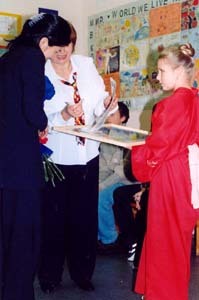 On 18 of November was the great openning of the exhibition. 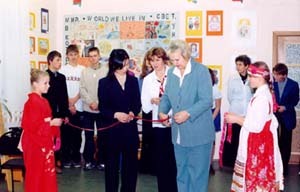 Yagoto Yaei, vice-counsil of Japan, the deputy of the head of the district and Elena Lialiagina, principal of school "Epigraph" cut the red ribbon and the exhibition was opened. 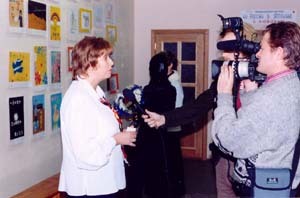 Journalists from television were invited. They made a small video-film about the Openning ceremony of the exhibition. We presented to Yogoto San on of the drawing of our students and the school newspaper that was printed especially for the openning of the exhibition. She also presented small souvenirs, books about Japan and Japanese pencils to students of school "Epigraph" that participated in the project. 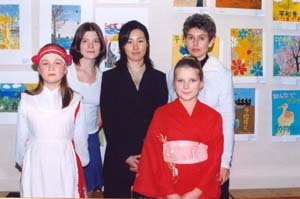 Yogoto Yaei, vice-counsil of Japan in St.Petersburg, Nina Butovich and Barbara Lialiagina, coordinaors of the project and students of school "Epigraph" in Japanese and Russian costumes.